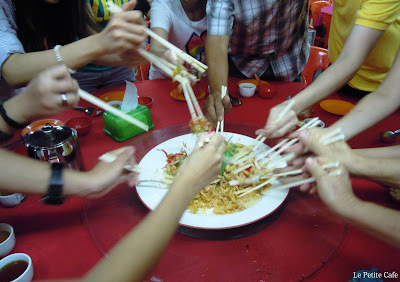 Eating Yee Sang is a tradition during Chinese New Year in Malaysia It is basically a raw fish salad (usually come in slices of salmon). Vegetarian version is also available to catered to those who follow a vegan diet. The fun of eating Yee Sang is tossing all the ingredient together as seen in the photo. Chinese loves symbolism. Yee meant fish in Chinese and it sounds like 'abundance', hence the higher you tossed, the better as the act of tossing (lou sang) symbolises increased prosperity. As far as I know, this dish is invented in Malaysia, but then Wikipedia said it's from Singapore, so I can't confirm on that. Yee Sang and Lou Sang are popular among the Chinese from South East Asia. Yee Sang is my favourite dish during Chinese New Year. The photo above was taken at a dinner with my cousins. It's the fifth lou sang I have for this year - 3 Yee Sang few days before the Chinese New Year and 1 during the reunion dinner. I'm sure there will be more to come because Chinese New Year officially lasted for 15 days. Wishing everyone prosperity, happiness and good health always! Happy Rabbit Year!